Villum Research Station is a research facility at the military outpost Station Nord in high arctic North Greenland (81°36’ N, 16°40’ W). The station is a substantial upgrade of an existing air pollution monitoring station at Station Nord. 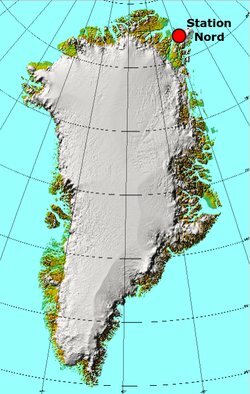 Villum Research Station is situated at the northeastern corner of Greenland, on the small peninsula Princess Ingeborg Peninsula. The nearest town is Longyearbyen on Svalbard (Norway), 720 km east of Station Nord, while the nearest town in Greenland is Ittoqqortoormiit, 1,250 km south of Station Nord. Station Nord is a gateway to the national park of NE Greenland, and a support and refurbishment base for the Danish dog sledge patrol Sirius. Villum Research Station is owned by the Greenland Government and is being operated by Aarhus University (Denmark) in cooperation with the Danish Defense (the Arctic Command). The station was founded in 2014 based on means provided by the Danish private fund Villum Foundation. The station hosts individual scientific projects focusing on atmospheric, marine and terrestrial research. In addition to this, the station is also used as a permanent base for an extensive long-term monitoring programme with main focus on atmospheric pollution, but also including effects of Climate Change on arctic marine and terrestrial ecosystems. The station is open for access throughout the year, and it can host up to 14 scientists at a time. About the station gives a further description of the facilities at the station and its location. Administrative structure provides information on organisation and members of boards. Access to the facility explains how to arrange a stay at Villum Research Station. Metadata for monitoring activities provides an overview of monitoring activities - e.g. which atmospheric pollutants have been measured since the 1990's. See the left menu for a number of further items. 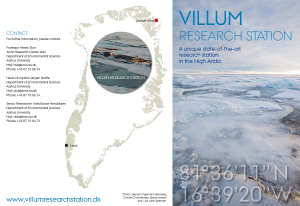 There is a pamphlet on Villum Research Station (pdf file, opens in new window). Measurement campaign carried out at Villum Research Station.